1) Callaway can get more weight back in the rear of the club. This raises the MOI so that off-center hits don't cause the face to twist, which can lead to a lot of looking for lost golf balls in the woods. 2) The other advantage is that the clubhead is aerodynamic. The triangular shape lessons drag, allowing for more clubhead speed with less effort. This is good news no matter what level of golfer you are. The shape reminds me of the TaylorMade Burner SuperFast, only it's not as drastic. The Superfast is even bigger. 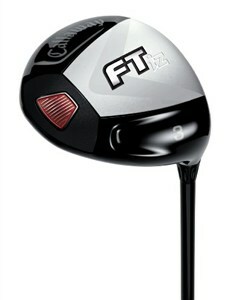 The other cool thing about this FT-iZ fairway wood is the hot face. The designers have taken a stainless steel face and frame and merged it with a carbon-composite crown. Also, they added weight plugs in the toe, heel, and rear to balance the face and raise the MOI. I recommend this fairway wood to all levels but especially mid to high handicappers. For you better golfers looking for a more traditional clubhead, check out the TaylorMade Lady R9 Fairway Wood.